Benjamin Luengas and his great-granddaughter Selena stand next to the water tank the family received last October, thanks to a grant from a local bank. .
MONSON, California — One by one last summer, like candles snuffed in a strengthening wind, the wells of Monson went dry. In the unsparing heat of California’s hottest year, the misfortune spread. Wells went dry in nearby Cutler, Yettem, and Orosi. They went dry in Farmersville and Lemon Cove; in Exeter and East Porterville; in dozens of formerly anonymous crossroad towns on the east side of Tulare County. When I visited Monson in July 2014 to report on the county’s water crisis, one resident described the community as a “lost world,” a place bamboozled by bureaucracy, hindered by poverty, and lacking the political power to shift the gears of state assistance. Some of those residents found help, but far more have not. Thousands await the day when “collect water” is removed from the to-do list. An unincorporated rectangle of land in Tulare County, tiny Monson, home to no more than 200 people, became an international symbol of the rural heartache that is flowing from California’s drought wound. 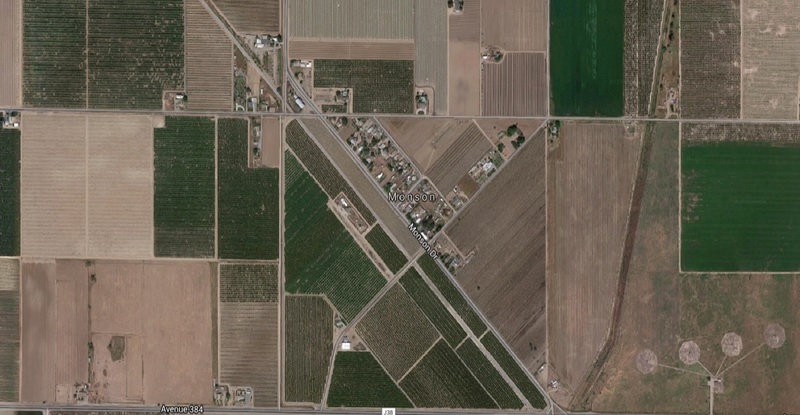 Surrounded by acres of Central Valley vineyards, pomegranate trees, and orchards of plums and almonds, the community’s shallow domestic wells had no chance against the competition: some of the nation’s most lucrative farmland. Tulare County is the nation’s richest county measured by farm sales — $US 8 billion in 2014 — and irrigators pumped enormous volumes of groundwater, without restriction, from great depths to keep their fruit and nut assets alive and producing. Lower and lower the water table dropped as the electric pumps whirred. Soon, sand began spilling from faucets and toilets. The families of Monson did as strong families do: they endured. Some hauled water by pickup truck, in trash cans and plastic drums, from relatives who lived in Visalia and were connected to city water. One family ran a hose from a friendly neighbor who still had a decent flow from his well. I returned last week to Monson, more than a year later, not knowing what I would find. Would the community still stand? Who was still enduring? The yard sale in the Colunga family driveway is the first sign of life I see. Gladys, the mother, recognizes my face, if not my name, as soon as she steps out of the house. Gladys had called Monson the lost world when I interviewed her shortly after the well failed, but soon after, the world found Monson. A stream of visitors with pens and cameras arrived to hear the community’s story. Big city newspapers and radio stations came knocking. Al Roker, of NBC News, interviewed Gladys in her kitchen last September. Even reporters from Agence France-Presse, the French news agency, found the tract of homes off of Avenue 384. The Colunga well went dry in June 2014. Jorge, Gladys’ husband, hauled water from friends in Orosi, eight kilometers (five miles) away. The family’s six children, from toddler to teen, learned to bathe from a bucket and how to hand-flush the toilet. Help came in October. The Colungas were one of the first in the county to receive financial aid for a new well. A grant paid for just more than half of the $US 25,000 price tag. The other half came from a low-interest loan administered by Self-Help Enterprises, a local nonprofit. Gladys did not know the source of the grant. The loan will be paid back over 20 years at one-percent interest. There is talk recently that Monson and six other communities in northern Tulare County might establish a regional drinking water system. The details are still vague and a study of how to set up, govern, and finance such a system is underway. The system, it is hoped, would provide reliable, clean water, treated to state and federal standards. That is the chapter of the Central Valley water story that is sometimes overlooked in the drought crisis. Even a functioning well here is not a permanent solution. Much of the groundwater is contaminated by farm pollution: by nitrates, which interfere with the blood’s capacity to transport oxygen, and pesticides. Summer life in Monson spills out of the house and into spots shaded by all manner of ingenuity: tarps fastened to tree limbs, umbrellas at odd angles, garages, and portable tents. Benjamin Luengas is beneath a patio awning, watching his young great-granddaughter, Selena, when I knock at his gate. Surrounded by farm fields, Monson is one of many communities in Tulare County with a water crisis. Last summer, Benjamin and his wife Lala ran a hose to their neighbor’s house for water after their well failed. A new well costs as much as their annual income. What bank would give a long-term loan to a couple in their seventies and eighties? Benjamin spies Selena, splashing water from a hose onto the family dog. 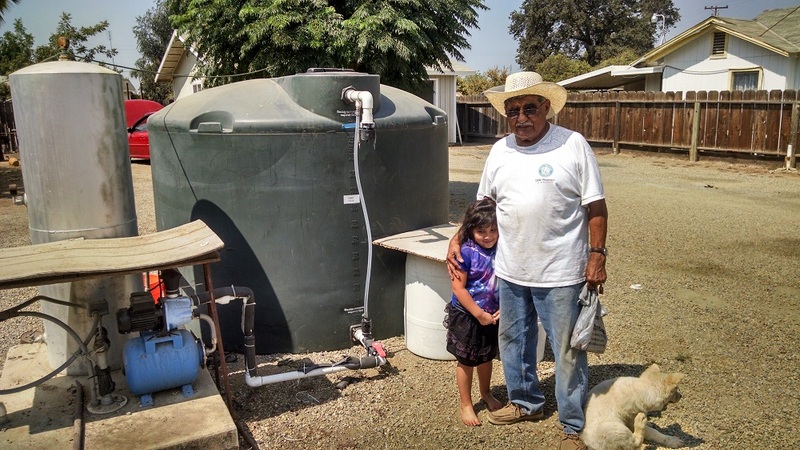 In October, thanks to a grant from Bank of the Sierra, Benjamin and Lala received a 5,678-liter (1,500-gallon) water tank that is connected to the house plumbing. A truck comes every week to fill the tank. The county pays for the cost of refilling and is reimbursed by state drought funds. After I said goodbye and turned to leave, he pivoted again to Selena, imploring her, this time in Spanish, to cut off the hose. “Ay, Chihuahua,” he said softly, his voice absorbed in the dry valley air, as he rounded the back corner of the house. The Colunga and Luengas families are two of the few good news stories in the Tulare County water crisis. Most residents with dry wells are still searching for water. Since the county began keeping count in September 2014, some 1,637 wells have failed. As of August 24, 288 families were receiving bottled water deliveries or had water tanks installed. Only 67 found the means to drill a new well. The other 80 percent still have no running water. County officials are barely keeping ahead of the problem. In the first three weeks of August, another 119 wells failed while 131 families got a water tank or a new well. New wells are being drilled deeper. The Colungas’ dry well was 21 meters (69 feet) deep. The new one punches 94 meters (310 feet) into the ground — just to be safe, Gladys said. The state, criticized last year for being slow to act, is moving with greater urgency and more money. Governor Jerry Brown signed a bill in March that established the Office of Sustainable Water Solutions within the State Water Resources Control Board, which will work on rural water issues. A budget bill passed in June allows the water board to merge small communities with larger water systems. A drought package passed in March provided $US 24 million for drinking water emergencies. Some of those funds will be used to help families with dry wells — through programs such as those that deliver bottled water — but the state is not allowed to give money directly for a new well. Even with the changes, the state will need funds to address the fallout from dry wells long after the drought ends, according to a recent report from the Public Policy Institute of California. Monson and the rest of Tulare County’s small places are no longer the lost world. But, having attracted attention, they are learning that solutions to the problem are even harder to achieve than being found.